I haven't participated in an Improv Challenge for a couple of months, but I decided I need to get back into it! I had been slacking in my duties as the administrator, so last month I handed the reins over to Nichole of Cookaholic Wife. This month's ingredients were peaches and cream. Fun! At first I thought I would bake something for my kiddos, but then my mother-in-law decided to take them off our hands for a week. Nice! I am really enjoying the quiet and my husband and I have enjoyed going out and socializing more than we usually do, but I am missing them and will be glad to have them home tomorrow. I made these muffins for a monthly study group my husband leads at our church. My contribution to the study each month is some sort of baked good. The timing worked out perfectly this month to try this recipe out. I found this recipe at one of those Starbucks copycat websites, even though I've never seen peaches and cream muffins in a Starbucks! I changed things up a bit. Here's my version. Preheat oven to 350°. Coat two and a half muffin tins with baking spray. Set aside. In a large mixing bowl, combine the flour, 2 cups sugar, baking powder, salt, and Pie Spice. In a separate bowl, mix together the canola oil, milk, eggs, and vanilla. Add the wet ingredients to the dry and gently incorporate. Gently fold in the peaches. In another bowl, soften the cream cheese in the microwave. Stir in the remaining ¾ cups sugar and the almond extract. The mixture should be somewhat firm; if it’s too loose, put it in the freezer for about 10 minutes. Fill muffin cups about halfway with the peach muffin batter. 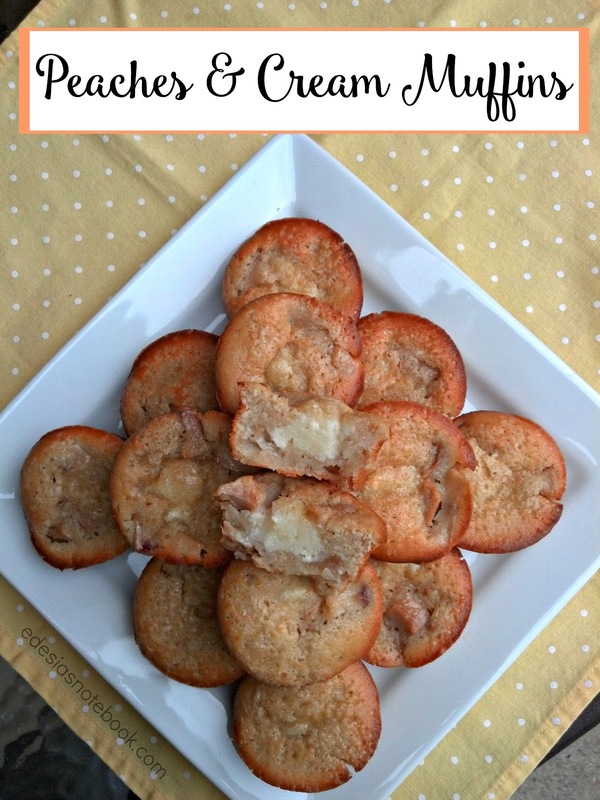 Drop a dollop of a heaping teaspoon of the cream cheese filling into each one. Top with remaining batter. Sprinkle tops with sugar in the raw. Bake for 30-35 minutes or until edges and sides are golden brown. Remove from oven and let cool 10 minutes in the pan, then remove to a cooling rack to cool completely. I used fresh peaches instead of canned. I thought canned would be too mushy. I was very disappointed, when I began peeling my peaches, to find that they were white-fleshed. :( I did not realize I bought white peaches. I just saw "Peaches .99/lb!" at the grocery store and grabbed some. I was a little bummed because I was looking forward to that pop of bright orange color they would provide; instead, these muffins are pretty mono-chromatic. But I wasn't about to drive back to the grocery store. So it is what it is! They will definitely be more visually appealing if you use regular peaches. Not a great pic; I realized sometime after I took it that there was a smudge on my camera lens. But you can see how I put these together. I stuck my cream cheese filling in the freezer for 10 minutes before filling because I kind of over-softened the cream cheese and the mixture was pretty runny. I was afraid if I put it in like that, that it would just kind of ooze into the batter and become one with it, which is not what I was going for. So that 10 minutes in the freezer helped to firm it up so the little cream cheese blobs kept their shape while baking. 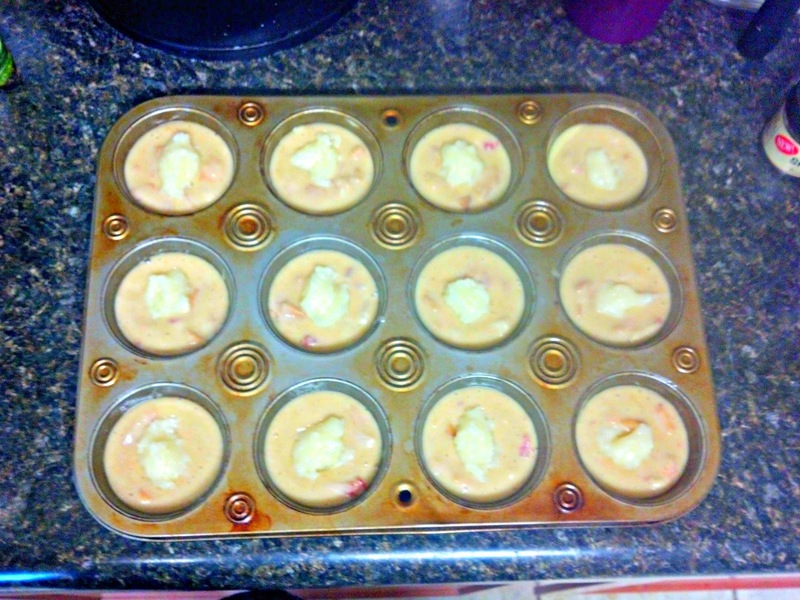 I was very worried after I put these in the oven, because I thought that I had overfilled the muffin cups. I always end up with more muffin batter than what the recipe calls for. Why? I have no idea. The recipe was supposed to make 2 dozen muffins. I filled them pretty much completely to the top, and still had enough batter and filling leftover for another half dozen. I grabbed my jumbo muffin tin and made a few jumbos. (Stuck them in the freezer for when my daughters come home. So they're not missing out!) With filling the cups so full, and with the batter being so thin, I was worried they would spill out and all have flat tops that ran into each other. But I was pleasantly surprised to find nothing of the sort when I went to check on them. 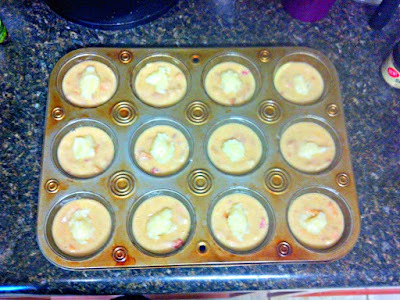 They aren't the prettiest muffins ever, no pretty domed tops, but at least they didn't spread out and make a mess. I had to bake them longer than what the recipe called for to get them golden brown. Despite the bland color of the peaches, these muffins were really great. I tried a bite of one and wish I could have eaten more. They were a hit at the study group. I can't wait for my girls to try them when they get home. 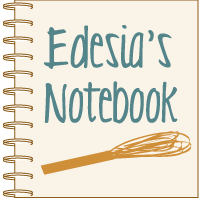 Be sure to check out all the other great peaches and cream recipes below and come back next month to see what I make with garlic and rosemary.